Subsensory electro acupuncture micro current provides immediate results to the muscle tone and texture of the face, stomach, buttock… or to whichever body regions the therapy is applied. The effects of this treatment are cumulative and continue to build with a series of treatments.With each painless, non needle, Electro acupuncture current facial lift treatment, healing energy levels are boosted and retained. This explains why the results are cumulative, and the visible effects become better and better as the series of treatments progresses. Think of it like working out: the more you work out and the more committed you are, the greater the results… and the longer those results stay.With each treatment, the skin absorbs more and more of the key neuro-electric energy causing the skin and muscles of the face to become progressively stronger; plumping up the outer skin layer, lifting and tightening the muscles, and erasing wrinkles and deep lines. 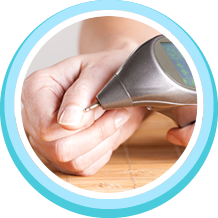 Because the gentle level of Electro acupuncture current delivered mirrors your own bodies natural electrical impulses, your skin and muscle tissue respond very quickly resulting in firmer muscles and well hydrated skin overall. As the skin ages, skin cells lose much of their natural energy (similar to a battery losing its charge) which leads to a breakdown of collagen and elastin production and effect. Some facial muscles become increasingly contracted over the years of facial expressions; others become elongated over years of age and gravity. Imagine how good you’d look and feel if we can accept your case and ‘take’ a decade or two off your appearance. Contact us today to find out more!